On its new premises the Dutch yard Jongert is building a new 29 metre sloop to be launched by the end of the year. 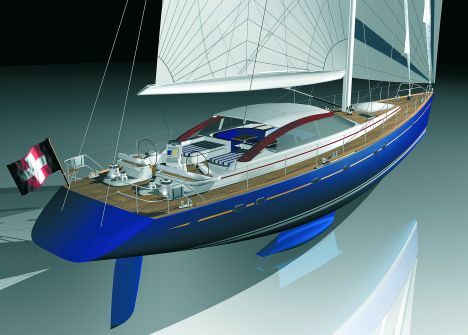 "Ameena" is the first in a small series of Jongert 29 metre yachts which already promises success. For the moment, as well as "Ameena" there is a second sloop under construction, the same size but with certain variations in deck layout, sail plan and related equipment. Both yachts however were designed by the well known architect Tony Castro who is also involved in other projects for Jongert. "Ameena" is designed on two decks, developed to emphasise to the full her attributes of comfort rather than of pure performance. This building prerogative emerges at first sight from the structure of the main deck whose design did not follow stylistic canons linked to the search for maximum speed - such as a flush deck solution - but opted for a deckhouse, thus ensuring suitable comfort for the owner and his guests on a deck normally dedicated to sailing the vessel. So over and above the area aft, equipped for handling the yacht, there is a spacious deckhouse with a relaxation area - two facing C-shaped sofas and two tables - and the indoor command bridge. Deck equipment was designed and created for sailing with a minimum crew, so there is no lack of automation and simplified rigging. The night area on the lower deck is divided into two distinct zones. Going down from the deckhouse you directly access the dinette: on the port side, a roomy C-shaped sofa and a dining table, and on the starboard side an L-shaped sofa with a cocktail table. Ere are also charts, instrumentation and a multimedia system. The first night area is aft of the dinette and is exclusive to owner and guests. Farther aft there is a VIP cabin on the port side and a twin bed cabin on the starboard side, both with private bathroom and separate shower. The owner's suite is fully aft, also with private bathroom and separate shower and furnished with a king size double bed, wardrobe and office corner. The crew's quarters are forward of the dinette and consist of a dining/relaxation area with sofa and table, a spacious live-in galley and two cabins with bunk beds and private bathrooms. Right at the stern, the garage for the tender is accessible by means of a hatch in the transom which can also be used as a bathing platform. For further information: Jongert B.V., Industrieweg 6, NL-1671 EW Medemblik; tel. +31 (0)227 542544, fax +31 (0)227 541246; website www.jongert.com; e-mail info@jongert.nl. Sail area (mainsail-jib-gennaker): 1.005 square metres.